"Blend" is the cut of a type of tobacco that glistens at six places in Beirut under the glowing stone of the water pipe at the film’s center. "Blend" also means "mingling", to "mix", resulting in a "mélange". And this is precisely what happens in thirty minutes of low-key black-and-white compositions in which those portrayed talk about the need for daily sports and also about Gaddafi’s fortune, Arab spring, the Middle-East conflict, and gender relations in supposedly post-modern societies. Blending in Fritz Ofner’s film is the personal and the political, the anecdotal and the concrete, the proclamation of opinion and the presence of material sites. In doing so, the film itself takes on the form of relaxed tobacco consumption; breathing in with every conversation fragmentary thoughts of the people of Beirut in spring 2011, to then casually exhale in between pillow shots of the city, reminiscent of Ozu Yasujirō. The mutual smoking of the shisha is merely a premise that people need to get together says one man leaning back relaxed, exhaling the cool smoke. The mouthpiece of the water pipe does actually become a microphone that one speaks into to share with the world and one’s vis-à-vis. And just as this mouthpiece functions as a medium between the people who gather in diverse constellations for this ritual in the film, the ritual becomes a medium between us and them. We wait for the mouthpiece to be passed on to us, for the exhaled smoke to emerge before the camera, thereby making us a part of this conversation. 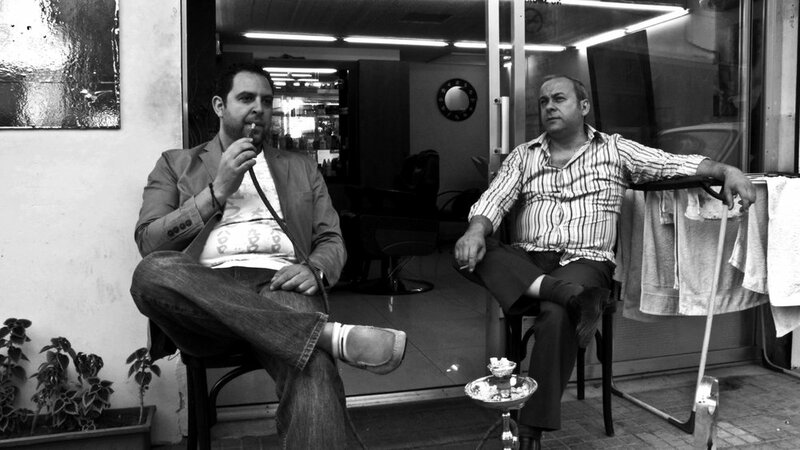 Clearly visible as homage to Jim Jarmusch’s Coffee and Cigarettes, Beirut Blend is, beyond the ritual and quotable elements, quite simply also a documentation of contemporary history-of things, opinions, moments, and a very special way of proclaiming through the medium of the shisha.